HCAI data shows that the majority of claimants see a chiropractor or physiotherapist which is expected since the majority claims are strains and sprains. But as the claims develop, claimants are seeing additional healthcare professionals. Although as many as 75% of claims are classified as strains and sprain and should fall under the minor injury definition, only a fraction of those claims receive MIG treatment only. A majority of those claims actually receive treatment within the MIG and additional treatment outside the MIG, likely when the MIG funding is used up. However, that is not to day that they are actually “escaping” the minor injury definition and cap. The average cost of treatment for strains and sprains is under $3,000. The IBC has now published the standard HCAI reports for the first half of 2014. The document provides over 75 pages of aggregate data collected by HCAI going back to 2011. HCAI was made mandatory on February 1, 2011. The standard reports are published on an “accident half year” basis. In accident half year statistics, the experience of all claims with accident dates in the same accident half year is grouped together. The accident half years are defined as calendar half years, with January to June being the first half and July to December being the second half for each of the stated years. The chart below breaks down the percentage of claimants receiving treatment per injury group. The data is further broken down by accident half year and the percentages are based on claims transactions between the accident date and June 30, 2014. The injury group sizes have remained consistent since the HCAI began collecting data. The data suggests that there doesn’t appear to be any obvious erosion of the minor injury definition. At least 70% of claimants receiving treatment are being diagnosed under strains and sprains which fall under the minor injury definition. The diagnosis does change over time when you look at previous periods in a chart I posted earlier this year. There has been some drifting from strains and sprains to WAD III (PN) and third degree tears (FD). 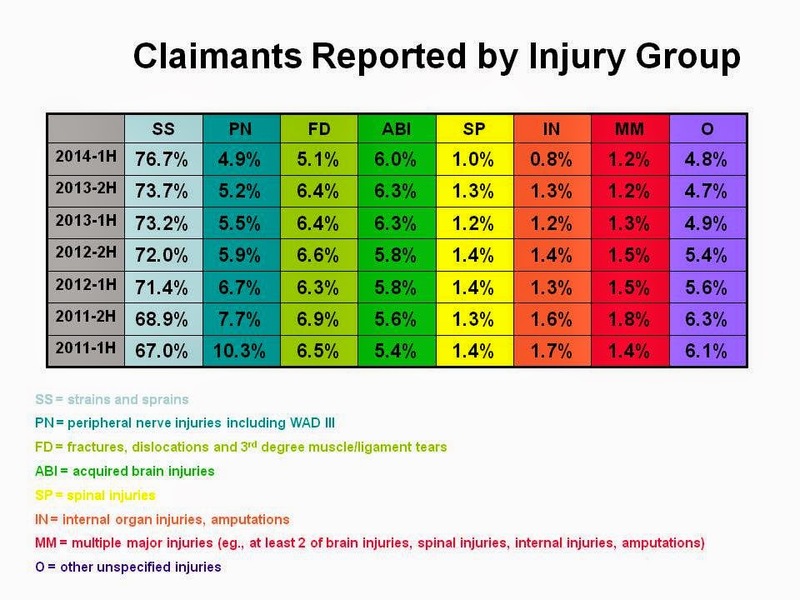 For example, for the first half of 2013, the SS injury group dropped 2.2% between the two reports while the PN and FD groups increased by 1.0% and 0.8%. This may reflect disputed claims and the time it takes to resolve disputes. Are Insurers Having Difficulty Keeping Claimants in the MIG?